I started practicing Affirmations when my husband and I started trying to get pregnant. I was getting so negative and so down. I really believed it was a lot of hocus pocus, but I also knew I could not continue the negativity. What little girl would want me to be her mom if I was feeling so yucky on the inside? I surely wouldn't have wanted to come live in my body at that time. Believe it or not, I wrote and thought "I have a healthy pregnancy" EVERYDAY for 6 months and I got pregnant. Now, my board says "I have a healthy, happy baby girl" EVERYDAY because well that's what I need now. Goodness knows, once those teenage years come, I'll be writing healthy happy teenager. 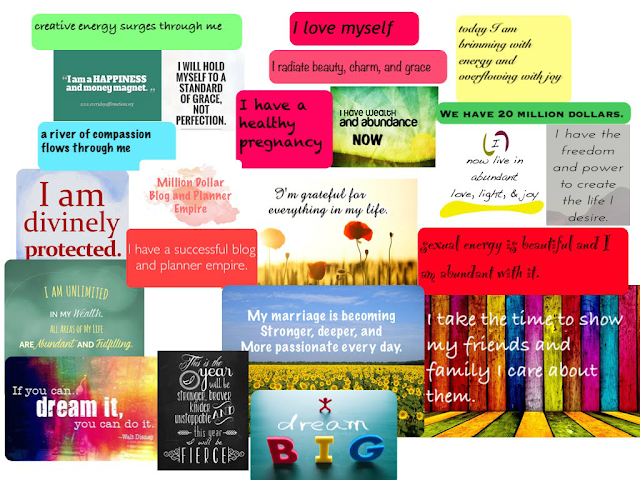 Similarly, I started a Vision Board when we were trying to get pregnant. The original one had pictures of little girls (not mine) in the center that I dreamed of having myself. Now, there's a picture of my sweet girl. More to come on the original vision board and how it has progressed.